​​​Dogs are always communicating... we just have to listen! ​What is your dog's preferred mode of communication? Ricochet's is planting... stopping and not moving forward. Cori's is vocal... whining, barking. Does your dog do something similar? How about nudging, or licking your face. Pay attention to what's going on in the environment, or with yourself when you notice your dog acting a certain way. We've been incredibly blessed to work with dogs in a therapy, emotional support and service dog setting. 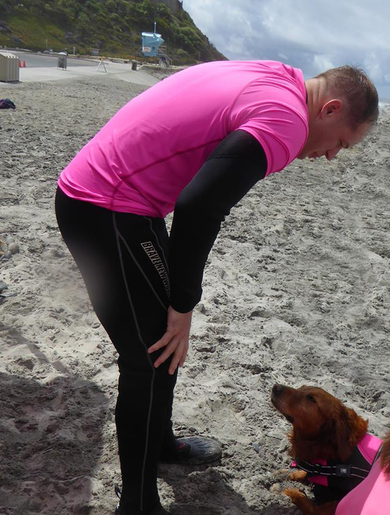 We have learned a great deal about dog communication through the dog's themselves... they are the best teachers. But, we have learned the most from Ricochet. She is very obvious in her communication. The problem is, we typically want to control them. We expect them to listen to us. If instead, we listen to THEM sometimes, and identify their natural tendencies while interpreting what they're trying to communicate, there is no end to their abilities because the more you listen, the more they say. Unfortunately, we often misinterpret their subtle, or not so subtle cues as bad behavior when they are actually trying to communicate something. In doing so, we miss the magic every dog is capable of. There have been many times passerby's make comments about Ricochet planting... stubborn, scared, doesn't want to listen, blah, blah, blah. We misinterpret so much of what dogs are trying to communicate to us. So much. What if you stepped back, and instead of looking at their behavior as "bad", look at it more objectively? What is happening at that moment? What's going on around you? ​​A good example of perceived misbehavior, is our pup, Cori. In this video, it appears she is trying to bite the inflatable swim ring around the child's neck. We could think its bad behavior because she would pop it. Then, Cori tries pulling the child out of the pool by the flipper. Again, we could interpret her behavior as bad. But, what if Cori is actually trying to tell us something? When we look at the behavior, we see a dog who is trying to get the child out of the pool. At the end of our lesson, Gracie had a seizure. While we didn't realize it at the time, Cori was alerting to something happening before the seizure occurred. The bond between service dogs and kids is amazing. I saw it first hand. ​​In this video, Cori's behavior could be interpreted as bad. A barking dog. ​When she sees the child go down the slide, she jumps in the pool to make sure he's ok. Then she stands on the deck watching the other child in the pool. Her eyes keep darting from one child to the other. ​​Service members need to be hypervigilant in combat, but when they return to civilian life, it's hard for them to stop. They still feel threats are in the environment. Dogs are hypervigilant by nature, so if service members just watch their dog's body language, they don't have to be on high alert. If the dog isn't reacting to a change in the surroundings, there is most likely no threat. In the first clip of the video below, a service member is at the counter of the visitor center in Balboa Park, talking with a person behind the counter. Since his back is to the door, and he can't see what's going on behind him, Ricochet "has his back" by facing that direction. I suggest to service members that they maintain some type of contact with the dog, so if the dog does react, they will be able to feel the change in the dog's body language. You'll notice in the video that this service member was petting Ricochet's head. ​Because dogs are naturally hypervigilant, service members don't need to be. Which takes a lot of stress off them. Dogs are aware of way more than the service members anyway. More aware than any of us! We just have to allow dogs to do their thing and stop trying to tell them what to do. They already know! Hypervigilant service members don't typically sit with their back to the door. They want to be in a position where they can see everything that is going on. This service member is sitting with his back to the door because he has Ricochet with him. She chose to lay behind him to see what he can't see. Although she's lying down, she is aware of everything around them. She continuously touches his hand to let him know she's there, and "has his back". This behavior reduces the service member's anxiety. ​from your brain which helps to reduce anxiety. Kids with autism are masters of listening and communicating with dogs... and they don't need words. 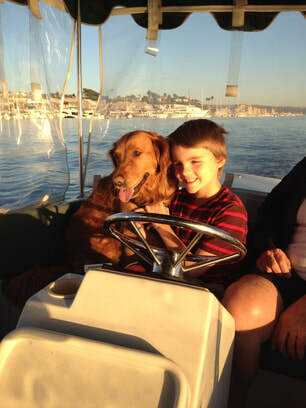 8 year old West was terrified of boating so his mom asked if Ricochet might be able to help. As soon as we walked out the back door toward the boat, Ricochet stopped and planted. I could tell by her body language that she was mirroring West’s fears and anxiety. I coaxed West to take one step at a time as he held Ricochet's leash. After many times of taking one step forward and five steps back, he finally got into the boat. West continued to be anxious, but after a while, Ricochet’s presence calmed West down. Then West lay back against Lauren’s chest and closed his eyes. He asked us all to be quiet so he could sleep. For many kids with autism, excessive noise makes for too much stimulation, and sometimes it’s overwhelming when too many people are talking at once. By quieting our voices, West could feel the sense of calm emanating from Ricochet. I think West knew on a subconscious level that he needed to concentrate on feeling Ricochet’s energy. ​As we all sat quietly, it was like a switch had flipped in West. Lauren’s dad unexpectedly untied the ropes of the boat from the dock, and West didn’t flinch. Fortunately, the boat is electric, so Lauren’s dad turned it on quietly, and again, no response from West. He just lay against Lauren. Normally even putting the key in the ignition would cause West to become frantic, triggering a full-blown meltdown. Before we knew it, we were pulling away from the dock. Some kind of incredible communication was happening between Ricochet and West on a heart level. With grins on our faces, we all remained quiet and shared looks of amazement with one another. Within a few minutes, West was so at ease that he opened his eyes, got off of Lauren’s lap, and actually drove the boat with a huge smile on his face, as Ricochet sat by his side at the helm. As he steered the boat back, he became our tour director: “Ladies and gentleman, on your right you’ll see a paddle boarder . . .” With Ricochet’s calming energy, and West's ability to listen to her, his experience of boating had completely changed from terrorizing to tame. Does your dog have an affinity toward children? Notice how they communicate with each other. You will find that they share a simple, emotional approach to life that adults don't. ​Are you misinterpreting what your dog is saying? How common is it that we get a dog and have all these aspirations for him or her. Agility, dock jumping, therapy dog, herding and scores of other activities we enjoy. We want our dogs to participate in them, but often the dog doesn’t want to do what you have chosen. Did you have preconceived notions of what your dog would do before you got him or her? What if you ask your dog what he or she wants? What if you honor the life lessons they are here to teach you?